[Updated March 27] The first of two teleconferences hosted by the GPS Wing underlined the U.S. Air Force’s desire to gain greater participation by manufacturers of user equipment in sorting out the options for mitigating the effects of a signal anomaly on the GPS satellite known as SVN49. The March 26 teleconference, held on the same day as publication of a notice in the Federal Register inviting public comment on nine possible options for dealing with the anomaly, drew only a handful of participants. But the U.S. Department of Transportation Research and Innovative Technology Administration (RITA), which issued the invitation, and the GPS Wing, which has the lead in implementing an eventual decision, hope to see further industry participation in written comments and a second teleconference planned for April 30. Led by Lt. Col. James Blake, deputy chief engineer for the GPS Wing, the presentation underlined the Air Force’s concern that receivers that don’t conform to the specification for GPS space segment/navigation user interfaces (IS-GPS-200) "greatly complicate the issue." The "non-compliant" user equipment may have software that doesn’t use all the information in the GPS navigation message or that assumes currently unused frames of the nav message may be exploited by receiver designers — only to discover that future upgrades of the system software implemented by the GPS control segment will cause non-compliant equipment to malfunction. said. "We really want to work with you." 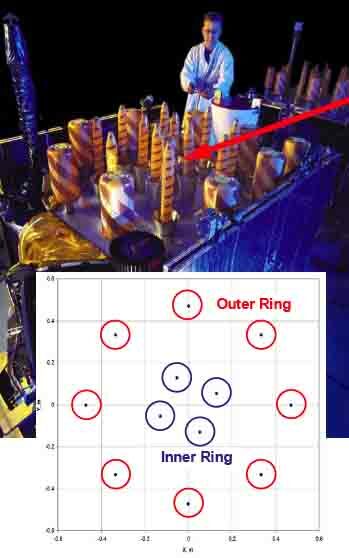 Noting that manufacturers and users may have to live with the decision for the next 20 years — given the performance of Block IIR satellites now on orbit, Lake said, "We don’t want to implement a solution and then discover there is a problem. We’ve done that before." GPS SVN49 has a unique signal that may result in degraded performance for some GPS user equipment. This satellite currently operates with the navigational message set in an unhealthy state to prevent any adverse effects on users. To minimize the adverse effects, several mitigations are under consideration. Each is intended for a specific user group and can be used with or without the other mitigations. All mitigations are intended for use with SVN 49 only, and no changes will be made regarding other GPS satellites. 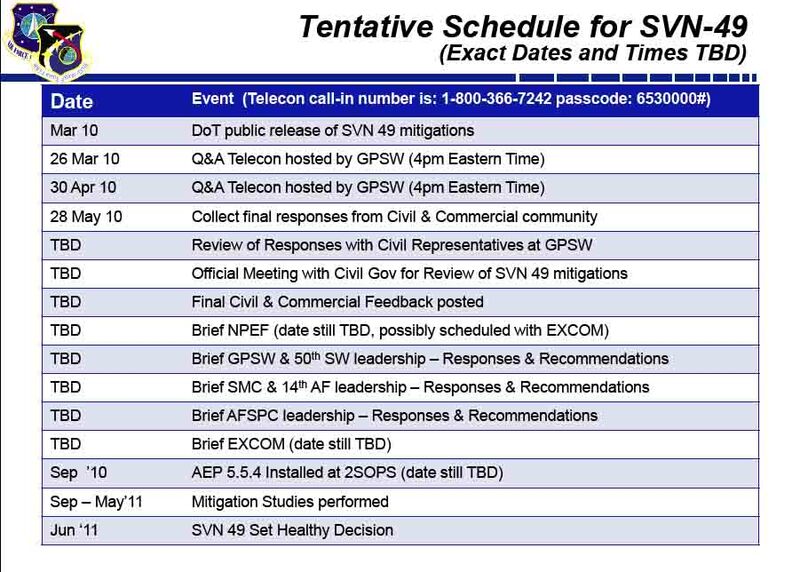 The GPS Wing and 50th Space Wing at the GPS Master Control Station, Schriever Air Force Base, Colorado, hope to implement the SVN49 mitigation decision in June 2011 (see accompanying table of the proposed schedule for addressing the problem). 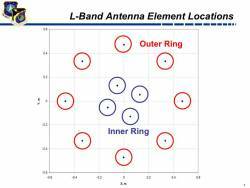 • Set SVN 49 healthy with current 152-meter Antenna Phase Center (APC) and associated clock offsets. • Increase SVN 49 User Range Accuracy (URA) minimum value to 3 by changing bits in the GPS data message that allow user equipment to de-weight or exclude SVN–49 signals. • Remove data modulation from L2 P(Y)-code to mitigate impact to high precision users. • Change SVN–49 from PRN–01 to PRN–32 to prevent updates to WAGE users. The second GPS Wing teleconference on the mitigation options is scheduled for 4 p.m. on April 30. The teleconference number is 1–800–366–7242; passcode: 6530000#. An informational briefing prepared by Col. David Goldstein, chief engineer at the GPS Wing, may be downloaded as a PDF here. The PDF includes a template for comments that can be submitted to the docket. Karen Van Dyke, DoT/RITA’s acting director for positioning, navigation, and timing, emphasized that, although comments at the teleconferences will be recorded, these must be submitted in writing to the RITA docket in order to be considered officially. The March issue of GNSS SIGNALS e-newsletter that will appear soon will have further details about the proposed SVN49 solutions and decision process.